Nowhere else in the world is a season so strongly associated to a particular bloom, than Japan and its beautiful cherry blossoms. And while the Japanese are undoubtedly excited about going to the park after work/on the weekend to enjoy the scenery, the rest of the world who a) haven’t been able to book their trips and b) can’t afford to travel will have to be content with looking at photos on Insta-feeds. sighs wistfully. There is hope, however. If you’re in KL (where we also have four ‘seasons’: hot, monsoon, mosquito and durian. 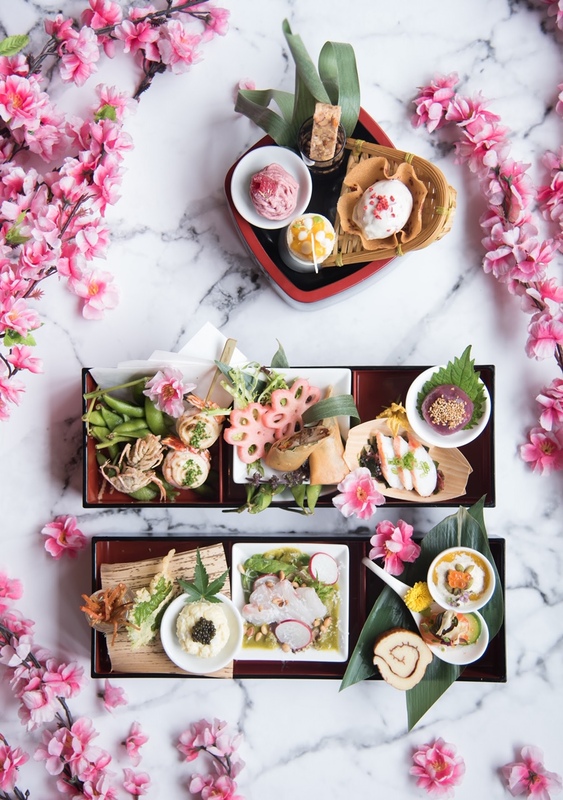 lol) and want to experience a slice of Japanese spring, Nobu Kuala Lumpur is having their Hanami high tea sets until end of April, featuring dishes inspired by Japan’s famous cherry blossoms. The Hanami High Tea sets come in three bento boxes, namely sushi, kitchen and sweet. 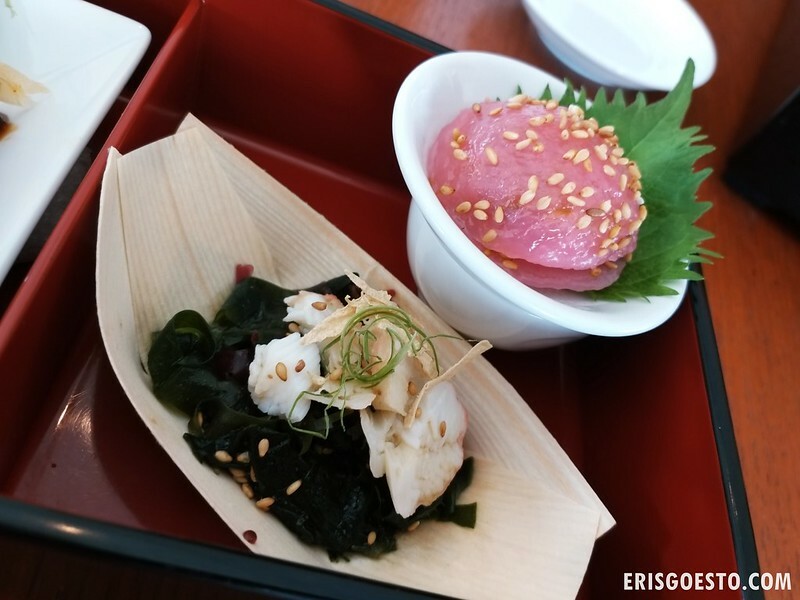 The sushi box features a selection of cold appetisers, the kitchen has heartier, more substantial bites, while the sweet is perfect for those with a sweet tooth. 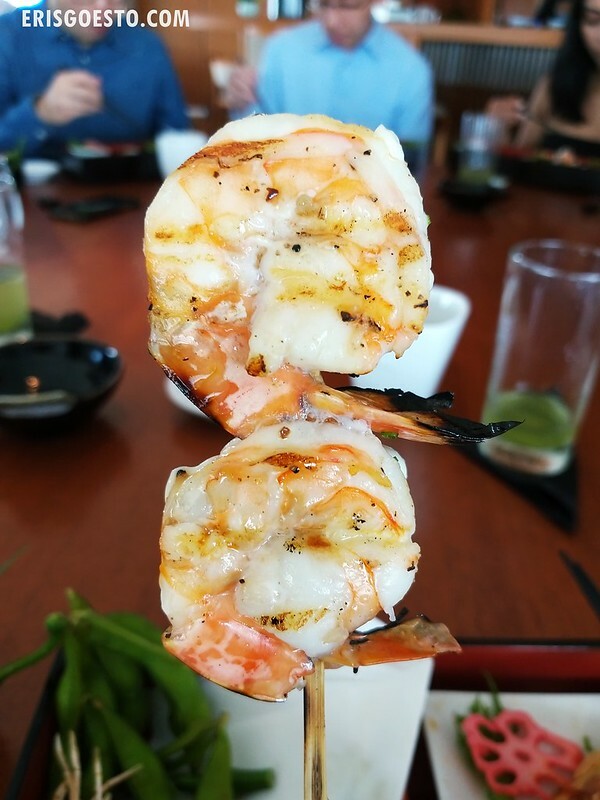 For the uninitiated, Nobu is the brainchild of Chef Matsuhisa Nobu, a Japanese celebrity chef known for his Japanese-Peruvian fusion cuisine. 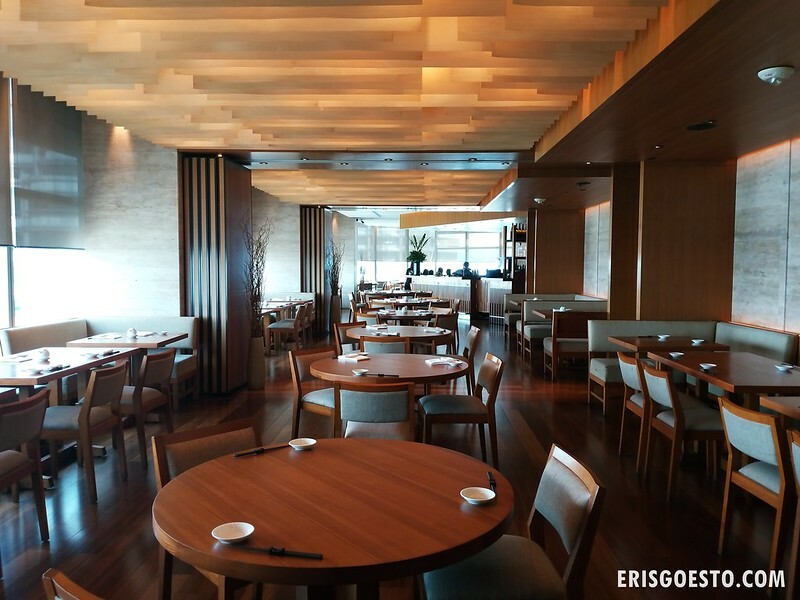 The Kuala Lumpur outlet, located on Level 56 of Petronas Tower 3, is a classy space that offers an excellent view of the iconic Petronas Twin Towers, as well as the city skyline. The classy ambience and top notch service immediately puts diners at ease – ideal for a night out with the S/O or intimate dinners with loved ones. 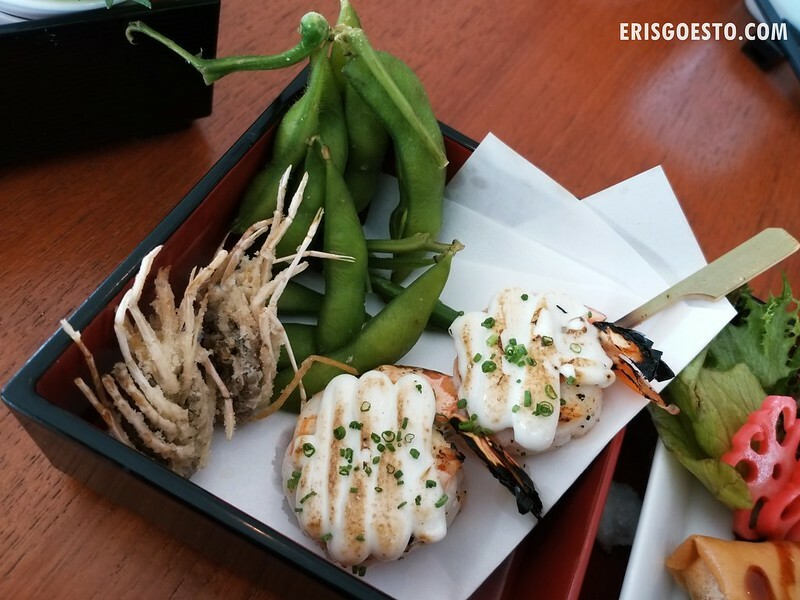 Start with the Hanami Sushi Bento, which comes with a platter of cold dishes, such as creamy Pumpkin Custard and Salmon Asian Pear. 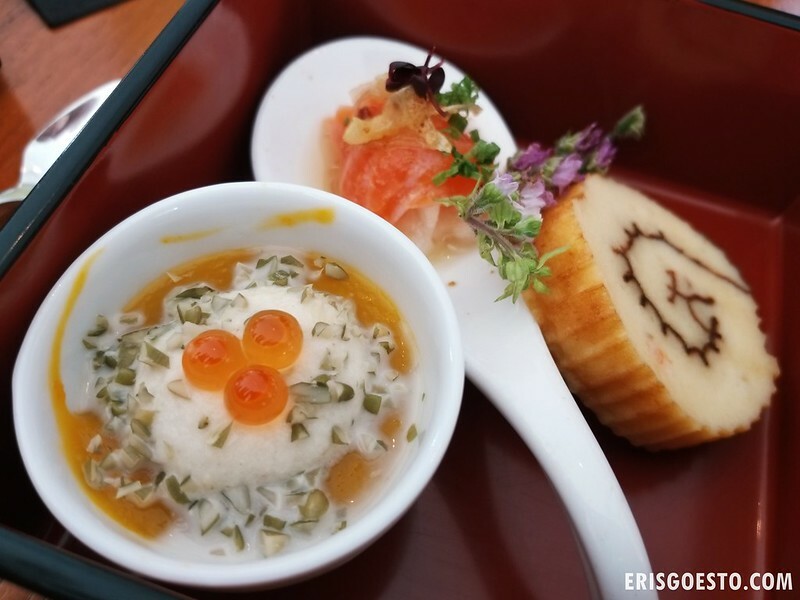 Served in a delicate bowl, the pumpkin custard was creamy and rich, topped with salmon roe for a burst of brininess, while the Salmon Asian Pear’s tanginess cut through the fatty salmon well. Served on the side was Datemaki or Japanese omelette – so fluffy it was almost like eating a sponge cake. 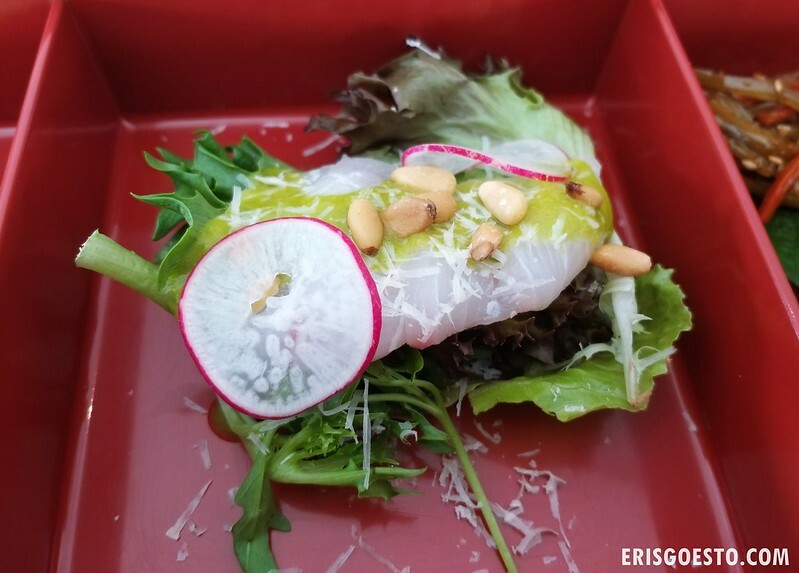 Also part of the set was Whitefish Sashimi Salad with Cilantro Dressing, Pine Nuts and Parmesan. A perfect blend of East meets West, the meaty whitefish has a fatty yet firm texture which works wonderfully with the earthy pine nuts and refreshing, herby cilantro. 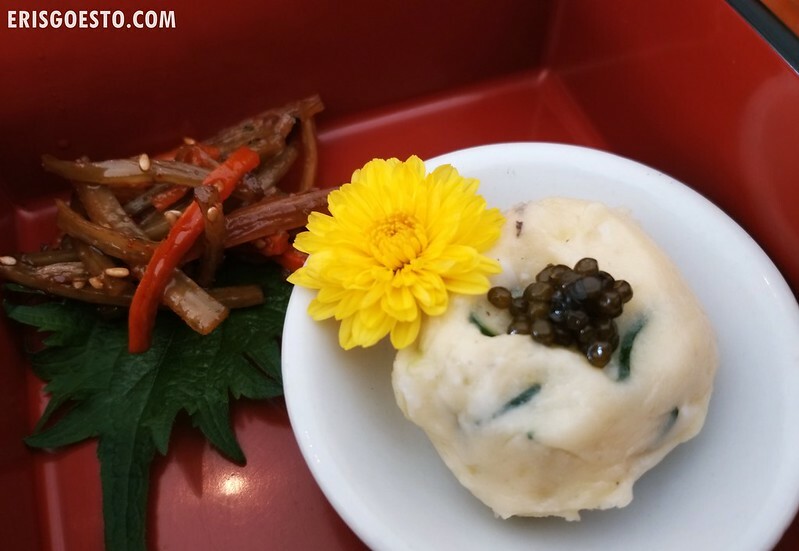 A simple Potato Salad is elevated with caviar, next to Kinpira Gobo (braised burdock root and carrot). Not a fan of burdock root in general, but those who like its sweet flavour and crunchy texture will enjoy this simple dish. 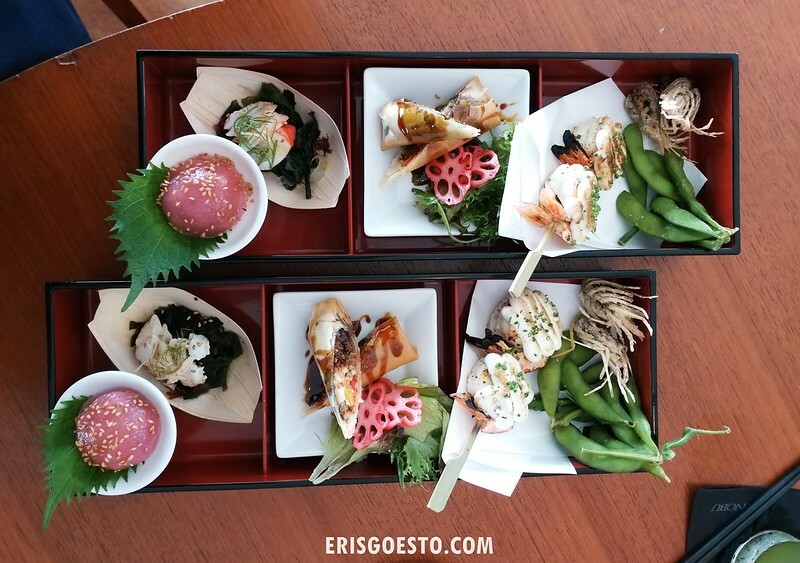 For something more substantial, opt for the Hanami Kitchen Bento, which comes with a variety of warm dishes. This is good enough for a complete meal imo as portions are generous, especially the shrimps. Grilled Shrimps with Garlic Aioli. The garlic aioli was creamy but not cloying, almost like a mild mentaiko sauce. Shrimps were giant! The meat was sweet and fresh as well, and I liked how they fried the heads so that you can enjoy them whole. Probably the most perfectly grilled shrimps I’ve ever seen! A bit of the shell left on and slightly charred for a smoky aftertaste. 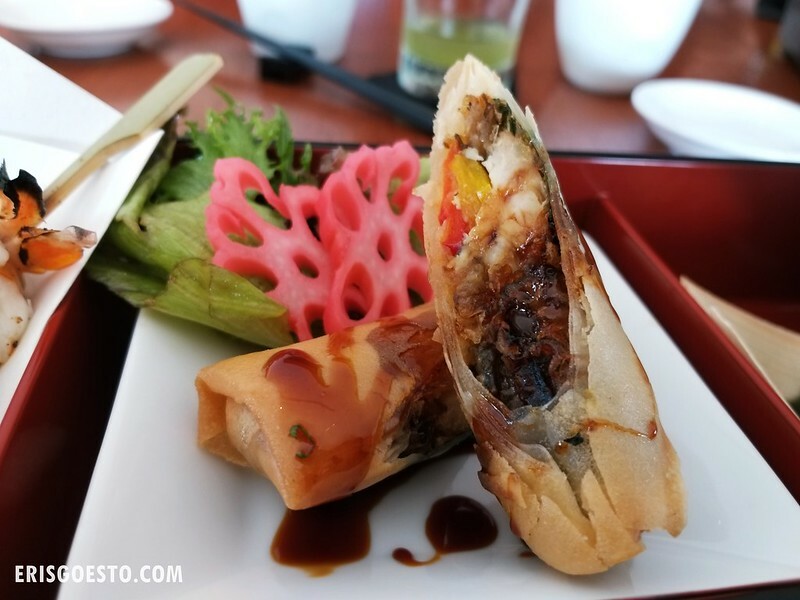 Meanwhile, the Soft Shell Crab Harumaki (spring roll) was fried to perfection. The unagi sauce acted as the perfect complement to the light and delicate crab meat. Rounding up the Hanami Kitchen Set was King Crab Miso with Ponzu sauce, and Sakura Chicken Dumpling With Black Soy Bean Miso. The latter had some curious reactions, as it’s not everyday you see a pink dumpling! 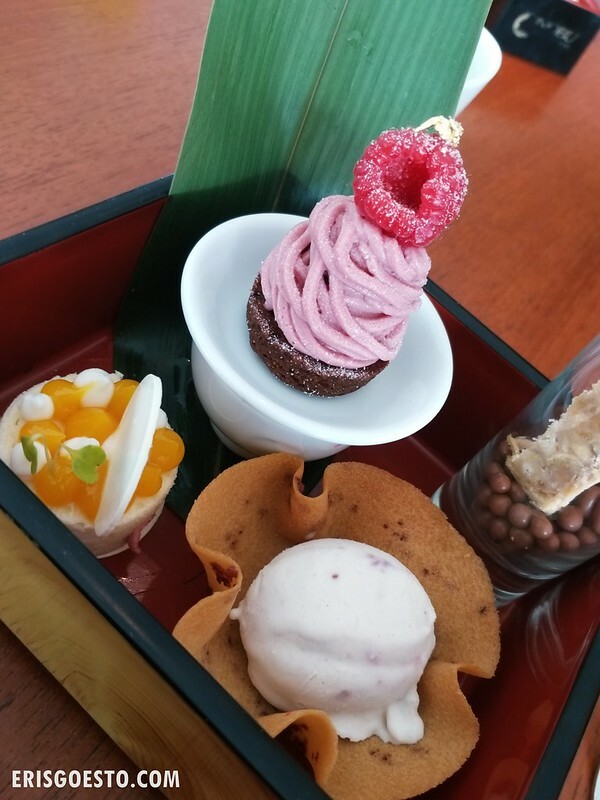 High Tea will not be complete without dessert, and the Hanami Sweet Set comes with four pieces: Sakura Strawberry Ice Cream, Chocolate Chestnut Tart, Fruity Crunchy Bar & Choco Pearls, and White Goma Sponge. Favourite was definitely the Sakura Strawberry Ice Cream, which came with a delicate cookie bowl, as well as the Fruity Crunchy Bar which was a nice balance of sweet and salty with its salted egg yolk coating. For reservations, call 03-2164 5084. Level 56, Menara 3 Petronas, Persiaran KLCC, Kuala Lumpur City Centre, 50088 Kuala Lumpur.